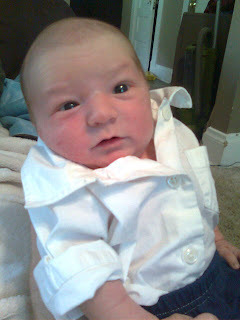 John had fun ironing Jack's little white shirt and dressing him for church! They looked really spiffy with their matching outfits and ties. 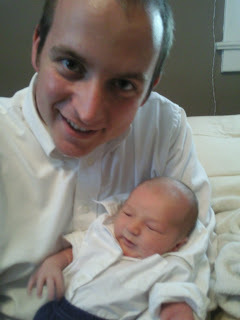 During all of sacrament meeting, Jack didn't even make a peep, he just slept in my arms like a little angel. 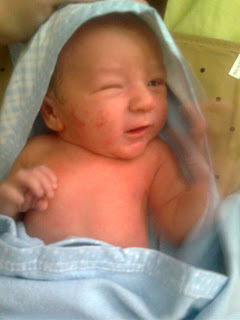 After an explosive poopy diaper, we were forced to give Jack his first sponge bath. He didn't cry at all in the hospital getting poked with shots, but getting bathed made me feel like I was torturing him to death because boy did he cry! Then, after that explosive episode, John was burping Jack over his shoulder and Jack took the opportunity to poo up the front of John's diaper and all over the front of John's shirt! 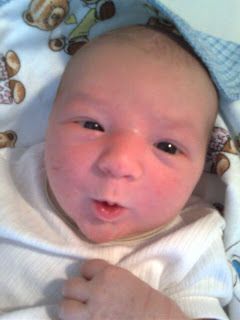 Good thing he's so adorable or daddy might not have responded so nicely! Haha! 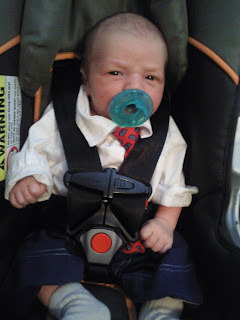 My baby HATED sponge baths, but once he started taking baths in his baby tub he LOVES them now...so just a few more weeks of torture and you should be good to go! Doesn't it brake your heart to hear them cry over baths? I'm sure he'll learn to love them soon, and then he'll cry when you get him out!